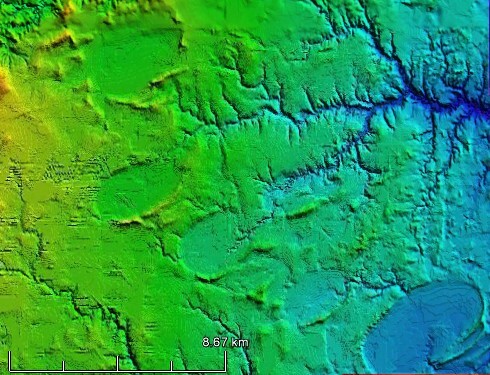 The Carolina Bays are large shallow elliptical depressions and wetlands with raised rims which are found east of the Rocky Mountains but are concentrated mainly along the Atlantic seaboard. The bays were discovered in the 1930s from the first aerial photographs of the Atlantic coast. The elliptical shape and alignment toward the Great Lakes was not discovered before aerial reconnaissance because the bays are very large and their shape cannot be easily determined from ground level. The Carolina bays are also called Delmarva Bays, Maryland Basins or Nebraska Rainwater basins. 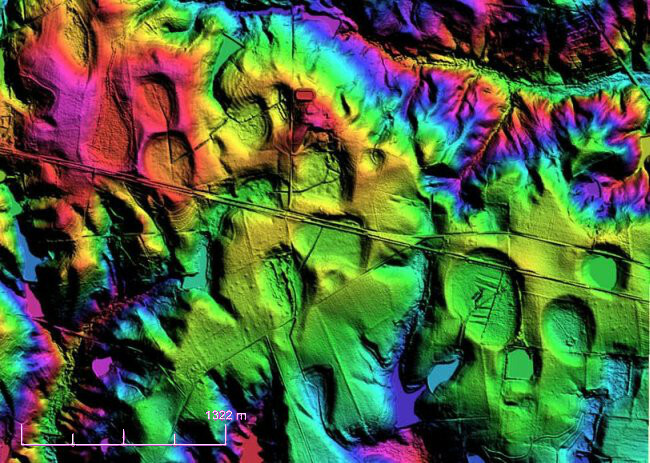 The invention of LiDAR in the early 1960s discovered a great number of bays by emphasizing the small differences in elevation. It is estimated that there are approximately 500,000 Carolina Bays. In some areas, the bays are so dense that all the ground is completely covered by them. The Carolina Bays are ellipses although some lack bilateral symmetry along either the major or minor axis. The southeast portion of many bays is more pointed than the northwest end and the northeast side bulges slightly more than the southwest side. Known major axis dimensions vary from approximately 60 meters to 11 kilometers. The Carolina Bays display a northwest-southeast orientation. Deviations from this orientation appear to be systematic by latitude (Prouty, 1952). The bays are shallow depressions below the general topographic surface with a maximum depth of about 15 meters. Large bays tend to be deeper than small bays, but the deepest portion of any bay is offset to the southeast from the bay center. Many bays have elevated sandy rims with maximum development to the southeast. Rim heights vary from 0 to 7 meters. Carolina Bays frequently overlap other bays without destroying the morphology of either depression. One or more small bays can be completely contained in a larger bay. The stratigraphy beneath the bays is not distorted (Preston and Brown, 1964; Thom, 1970). Bays occur only in unconsolidated sediments. Bays in South Carolina are found on relict marine barrier beaches associated with Pleistocene sea level fluctuations, in dune fields, on stream terraces and sandy portions of backbarrier flats (Thom, 1970). No bays occur on modern river flood plains and beaches. Carolina Bays appear to be equally preserved on terraces of different ages and formational processes. Bays are either filled or partly filled with silt of organic and inorganic origin. Ghosts of semi-obliterated Carolina Bays appear to represent former bays which were filled by terrestrial sediments and organic materials. Carolina Bays also occur in the gravels of Midlothian, Virginia at elevations that vary from 91 to 122 meters above sea level (Johnson and Goodwin, 1967). Midlothian is located approximately 27 kilometers west of Richmond. Although many Carolina Bays have been destroyed by erosion, the structural preservation of the Carolina Bays may be partly due to the fact that they are found on flat porous landscape that allows rain water to quickly filter underground thereby preventing lateral water flow. The bays in Nebraska and Kansas occur in what once were the shores of the Western Interior Seaway of North America. This seaway disappeared by the Paleocene Epoch 60 million years ago after the Laramide Orogeny uplifted the Rocky Mountain region. The Midwestern bays are at elevations ranging from 400 to 900 meters above sea level and about 2000 kilometers from both the Pacific and Atlantic coasts. Fewer bays can be observed in the Midwestern states because only the larger bays have endured the erosion by water and the accumulation of layers of wind-blown dust and silt (loess). These bays are 197 meters (646 ft) above sea level and 200 km (124 mi) from the coast. Tests on the terrain of the Carolina Bays have produced wide range of ages. A study from the University of South Carolina (Brooks, 2010) reported that the dates obtained by Optically Stimulated Luminescence (OSL) indicate that wind processes had modified the shorelines of the bays in five stages dating from 12,000 to 140,000 years ago. OSL dating estimates the time since last exposure to sunlight for quartz sand and similar materials. Cosmic rays and ionizing radiation from naturally occurring radioactive elements in the earth causes electrons to become trapped in the crystal structures of buried quartz and other minerals. OSL frees the trapped electrons to produce luminescence in proportion to how long the quartz has been buried. One of the first proposals for the formation of the Carolina Bays was made by Melton and Schriever from the University of Oklahoma in 1933. They suggested that a meteorite shower or a colliding comet coming from the northwest could have created the bays. Surface structures created by impacts only became accepted around 1960, when geologist Eugene M. Shoemaker presented criteria for establishing that Meteor Crater in Arizona was the result of an extraterrestrial impact and not the caldera of an extinct volcano. Using the criteria established by Shoemaker, scientists concluded that the Carolina Bays could not have been created by an asteroid or comet. Analysis of the Carolina Bays showed no evidence of a hyperspeed impact. Extraterrestrial impacts would have melted the target material, and impacts large enough to create the bays should have penetrated the soil, excavated bedrock, and produced distinctive signs of intense disturbance in the bedrock. The fact that there is no bedrock ejecta around the bays excludes the possibility that they were formed by extraterrestrial impacts. Geologists have proposed substrate dissolution, action of wind, marine waves and currents that reduce the volume of karst-like depressions which are later modified by wind or ice-push processes (May and Warne, 1999). 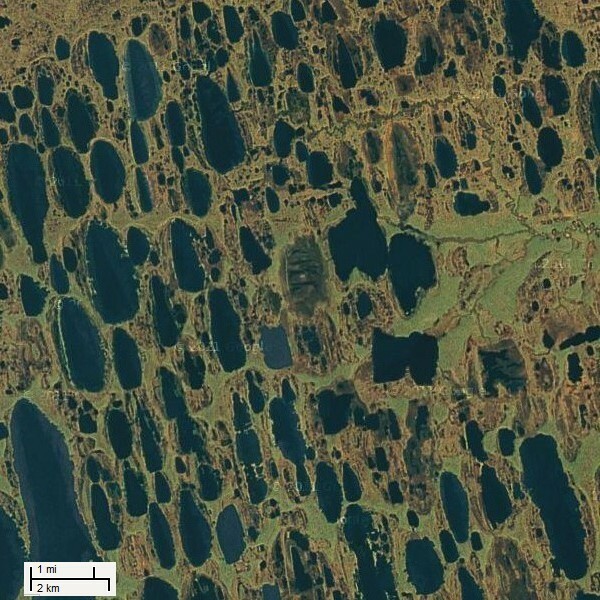 The bays have also been compared to thermokarst or thaw lakes that are circular or elliptical in shape and are often aligned with the prevailing wind (Melosh 2011). The problem with these terrestrial formation hypotheses is that they do not provide a mechanism for the formation of elliptical bays that radiate from a common point to account for the orientation of the Carolina Bays. In addition, the eolian and lacustrine processes fail to explain how bays at elevations of 200 meters or higher could have formed on ground that had not been close to the sea for millions of years. 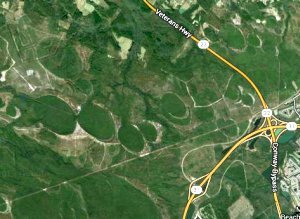 None of the terrestrial processes can explain why the bays have elliptical shapes with very similar aspect ratios. 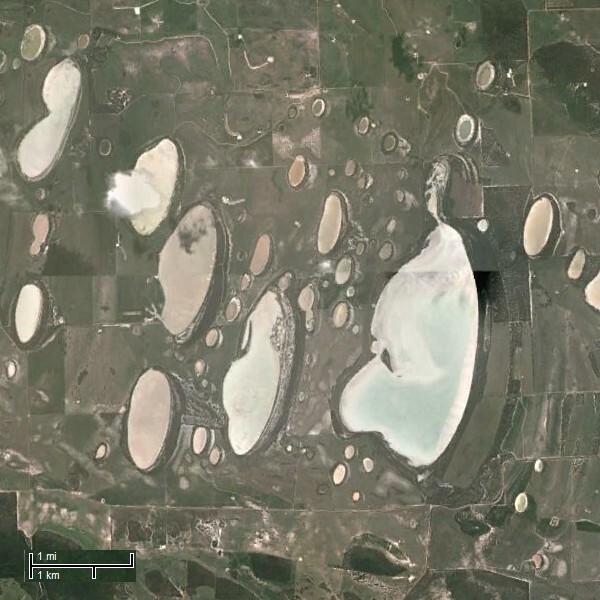 It has also been suggested that the Carolina Bays could have formed when marshy ground dried up like the Australian salt lakes, but this does not create the raised rims or overlapping ellipses which are characteristic of the Carolina Bays. In 2007, Richard Firestone proposed that an extraterrestrial comet airburst 12,900 years ago caused the late Pleistocene megafaunal extinctions and the Younger Dryas cooling event. In 2009, Firestone extended his argument by pointing out the orientation of the Carolina Bays and proposed that the comet impact could have struck the ice sheet that covered North America. His hypothesis proposed that fragments of the comet could have created the Great Lakes, but he did not explain how the bays were formed. The Younger Dryas Impact Hypothesis was soundly rejected by the scientific community (Pinter, et al. 2011) because Firestone and his colleagues had not provided the type of impact evidence established by Shoemaker for hypervelocity impacts. In addition, the claim that the Carolina Bays could be used as evidence of an impact was rejected because there was no crater from an extraterrestrial impact and the bays had different dates which meant that they could not have been created by a single event. The new impact hypothesis proposes that the Carolina Bays were made by impacts of ice ejected from a glacier by an extraterrestrial impact. The formation of the bays by secondary impacts is consistent with the physical characteristics of the bays. The impacts should have occurred on soft ground so that the ice could penetrate and form oblique conical cavities that would later transform into elliptical bays. The following table has the coordinates and sizes of 23 Carolina Bays. The bays have clearly defined borders that make it possible to measure the major and minor axes accurately using Google Earth with a LiDAR overlay. The dimensions of the bays correspond the impact angles from 31 to 41 degrees. 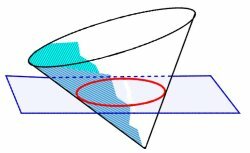 The interpretation of the elliptical bays as conic sections whose eccentricity depends on the angle of impact is a reasonable explanation for the geometrical regularity of the bays. Thus far, oblique impacts by ice offer the best mechanistic explanation for the formation and orientation of the Carolina Bays, but it will take additional research to establish this conclusively. Firestone, R.B., West, A., Kennett, J.P., Becker, L., Bunch, T.E., Revay, Z.S., Schultz, P.H., Belgya, T., Kennett, D.J., Erlandson, J.M., Dickenson, O.J., Goodyear, A.C., Harris, R.S., Howard, G.A., Kloosterman, J.B., Lechler, P., Mayewski, P.A., Montgomery, J., Poreda, R., Darrah, T., Que Hee, S.S., Smith, A.R., Stich, A., Topping, W., Wittke, J.H., Wolbach, W.S., 2007. Evidence for an extraterrestrial impact 12,900 years ago that contributed to the megafaunal extinctions and the Younger Dryas cooling. Proceedings of the National Academy of Sciences 104, 16016–16021. Firestone, R. B., The Case for the Younger Dryas Extraterrestrial Impact Event: Mammoth, Megafauna, and Clovis Extinction, 12,900 Years Ago. Journal of Cosmology, 2009, Vol 2, pages 256-285. Preliminary interpretation of the high-resolution seismic stratigraphy beneath Lake Michigan. Open-File Report no. 91-21. United States Geological Survey, Woods Hole, Massachusetts. A Handbook of Shock-Metamorphic Effects in Terrestrial Meteorite Impact Structures. LPI Contribution No. 954, Lunar and Planetary Institute, Houston. pp 23-28. French, Bevan M.; Christian Koeberl, "The convincing identification of terrestrial meteorite impact structures: What works, what doesn't, and why", Earth-Science Reviews, 98 (2010) 123–170. Gamble, E.E., Daniels, R.B., and Wheeler, W.H. (1977). Kennett, D.J., Kennett, J.P., West, A., Mercer, C., Que Hee, S.S., Bement, L., Bunch, T.E., Sellers, M., Wolbach, W.S., 2009a. Nanodiamonds in the Younger Dryas boundary sediment layer. Science 323, 94. Kennett, D.J., Kennett, J.P., West, A., West, G.J., Bunch, T.E., Culleton, B.J., Erlandson, J.M., Que Heeg, S.S., Johnson, J.R., Mercer, C., Shen, F., Sellers, M., Stafford Jr., T.W., Stich, A., Weaver, J.C., Wittke, J.H., Wolbach, W.S., 2009b. Shock-synthesized hexagonal diamonds in Younger Dryas boundary sediments. PNAS 106, 12623–12628. Martin, G. R., Finn, W. D. L., and Seed, H. B. (1975). "Fundamentals of liquefaction under cyclic loading." J. Geotech. Engrg. Div, ASCE, Vol. 101, No. GT5, May, pp. 423-438. Impact and Explosion Cratering, Pergamon Press (New York), p. 1003-1008. Melosh, H. J., (1979) Acoustic fluidization: A new geologic process? Melton, F. A., and Schriever, W. 1933. 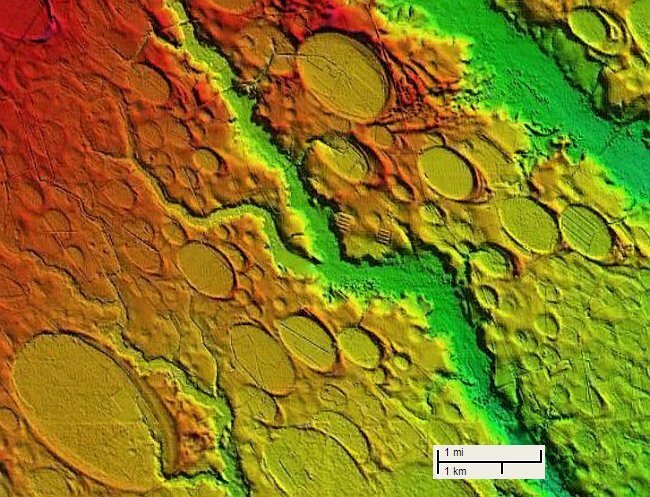 "The Carolina 'Bays' – Are They Meteorite Scars? ", Journal of Geology, Vol. 41, pp. 52-66. Preston, C. D., and Brown, C. Q., 1964. Geologic Section along a Carolina Bay, Sumter County, S. C., Southeastern Geology, vol. 6, pp. 21-29. Prouty, W. F., 1952. Carolina Bays and their Origin, Bulletin, Geological Society of America, vol. 63, pp. 167-224. Richards, R., Jr., Elms, D., and Budhu, M. (1990). "Dynamic Fluidization of Soils." J. Geotech. Engrg., 116(5), 740–759. Schultz, P.H. (2009) in "Last Extinction: Megabeasts' Sudden Death", NOVA, written and produced by Doug Hamilton, Public Broadcasting System. Sladen, J. A., D'Hollander, R. D., and Krahn, J. (1985). "The liquefaction of sands, a collapse surface approach." Canadian Geotech. J., Vol. 22, pp. 564-578. Thom, B. G., 1970. Carolina Bays in Horry and Marion Counties, South Carolina, Bulletin, Geological Society of America, vol. 81, pp. 783-814.